What are the five rights guaranteed by the first amendment? What is the difference between a chromatid and a chromosome? 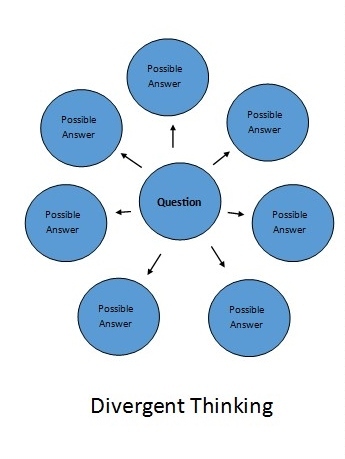 These kinds of questions spark recall or in some cases understanding, the two lowest rungs of Bloom's taxonomy of higher-order critical thinking skills. But with some prompting and modeling, it's possible to bump students up the taxonomy by getting them to formulate questions that seek analysis, application, connection or contrast. To be sure, a lot of these questions will be weak or ill formed, but success with this method isn't simply about the answers generated. 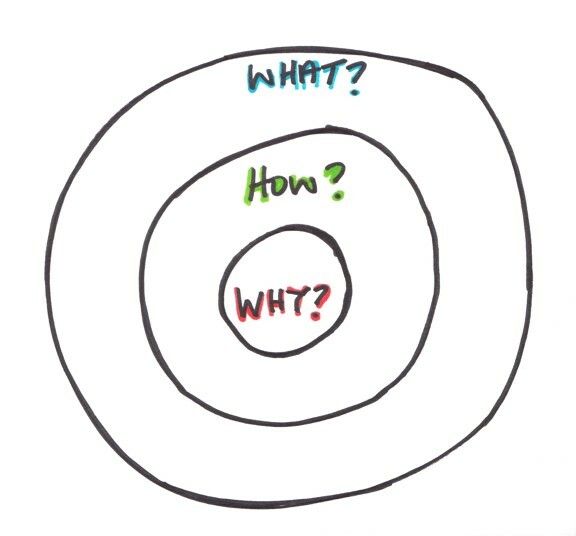 There's some value in the act of formulating the questions themselves. Here's what I mean. At left are questions my students self- generated for a Humanities unit in which we read Bacon's "Idols of the Mind" from Novum Organon, Hume's "On Miracles" from An Enquiry Concerning Human Understanding and Condorcet's On the Future Progress of Mankind. Students were asked to create a mix of level-one questions (recall, summarized understanding) and level-two questions (connection, contrast, application, analysis of structure). They had to write their questions and list all of the critical thinking skills needed to answer them. To answer the top question, for example, requires us only to recall what Condorcet said and to state it accurately in our own words. 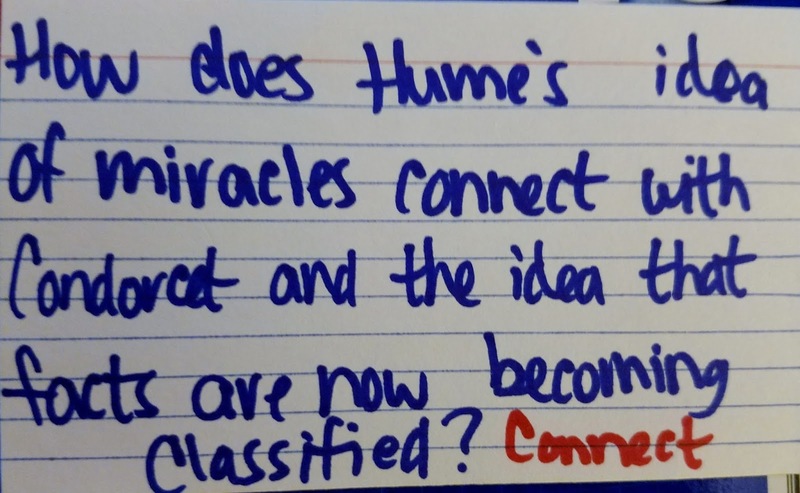 The middle question, on the other hand, requires us to understand Hume's claim about miracles and to see how it applies to a hypothetical example of our own invention. 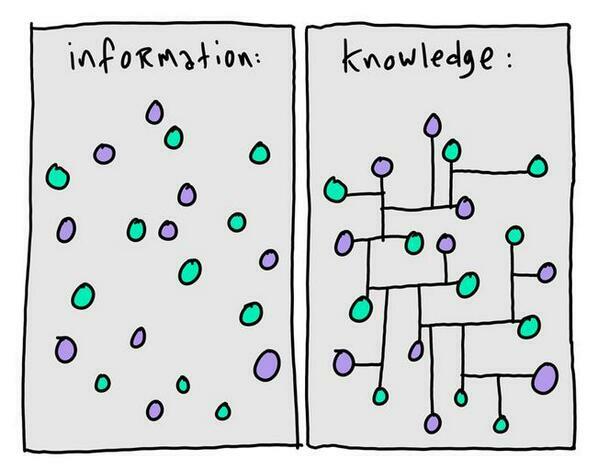 The bottom one actually requires quite a bit of critical engagement. We would have to both understand the two texts and articulate an evidence-based relationship between them. To even pose this question, you have to intuit a relationship is there, and this "sensing" (or intuition) is edging them toward how experts think. I say "edging them toward how experts think" and the key word here is edging. Students will not suddenly make the jump to light speed just because they posed their own questions. Unlike experts, they still lack what Aristotle called nous, a honed intuition about where it's propitious to start asking questions. As a result, you will have to suffer through some non-starter questions about silly relationships between ideas (How does Darwin's theory of evolution apply to the Yahoos in Swift's Gulliver's Travels?). But even these non-starter questions have value. Let the students gnaw on them a while and they will eventually realize this is a question not worth their time. Hence the one drawback to this approach. If you are professor who needs to cover a lot of content or who needs to instill some key content (Spanish verb tenses, math facts), this may not work for you. Moreover, it won't work unless you model, practice and incentivize higher order-question formation. 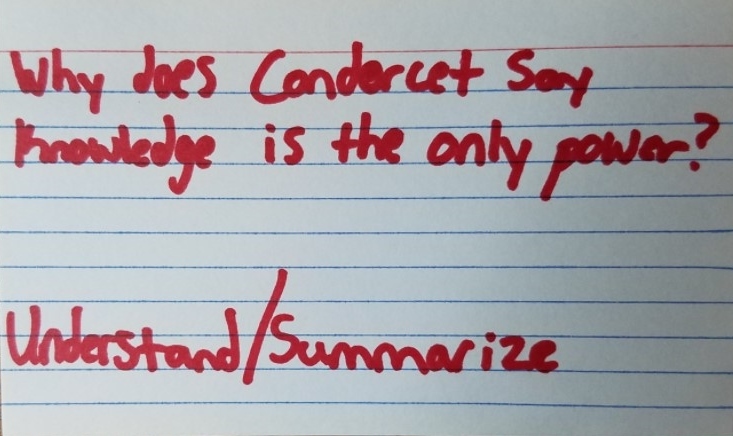 Indeed, if you ask students to self-generate questions without any modeling or prompting of good critical questions, they will inevitably produce those requiring simple regurgitation of definitions or summarized understandings (a lot of questions along the line of the top card above). The thinking here is pretty complex. The student intuited a connection between Achilles (who questioned the value of glory and loot in Book IX of the Iliad) and Socrates in the Apology (who questioned Athens' accepted norms), but she also saw how Asch's conformity experiments in the 1970s related to these ancient texts. These connections likely would not have happened if (A) I had not invoked the need to look for them and (B) she hadn't posed herself this question: how does idea X and Y relate to idea Z? That it was her question and her answer was paramount in this exercise. Had I made this connection, it would be just something I mentioned in class that she may or may not have found interesting. That she made it assures it's something that more likely interested her. It's my hypothesis that any connection she makes on her own is 10 times more valuable and likely to stick than those I make in class and require her to spit back to me in papers or exams. Of course making connections is one thing. Getting students to pose questions that take them to the top of Bloom's taxonomy is quite another. Next up: Questions that provoke evaluation and synthesis (why they're so difficult). Students just don't automatically make the connection because they know something. So is there a way to jump start connections? I don't know, but in my own teaching I've sure been trying the last several years. For what it's worth, here's what I've been up to. First, I try to drive home the first week of class that recall and an ability to demonstrate understanding are the the lowest levels of critical ability. What I want to see are connections between the ideas and texts we read. To make this point as concrete as possible, I ask the students on the second day of class to create as many conceptual frameworks as they can using the six images below. I explain that a conceptual framework could group together some, all or none of these images. They just have to define some organizing principle that governs how and why images can be connected or distinguished (e.g., these things are living, these non-living; these are manufactured, these found in nature, etc.). There is no right or wrong answer here. The only test for a framework is whether someone other than you can grasp the logic of your organizing principle. 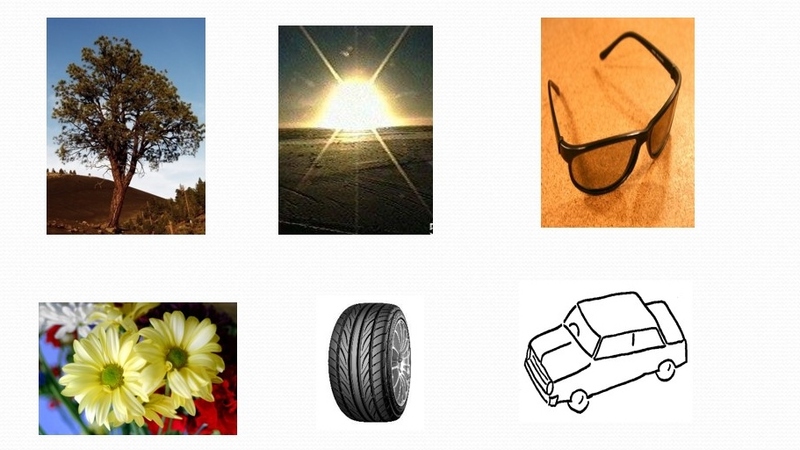 Then I give students three minutes to list as many concepts as possible using the six images. Afterwards we share possible frameworks and celebrate the really creative ones. Many students stall out after listing two or three frameworks. Others dash off 12-15. Interestingly young children do better at this exercise than adults. At around the age of seven my son listed 21 frameworks including one that really blew my mind. He said a man was out driving one day (car) and there was a terrible glare (sun). He realized he had forgotten his sunglasses at home just as he blew a tire and swerved off the road into a tree. And the flowers? They were brought to his funeral. I usually tell students that the ability to see multiple patterns or possible relationships in a data set is highly valued in this class. I also mention that people who are really good at this (stock analysts, medical diagnosticians, marketers, scientists, architects...) often get paid pots of money. 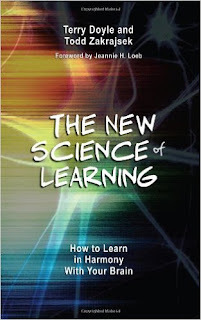 Psychologists call this divergent thinking and the library shelves groan with journal articles about its benefits. Ironically, however, many undergraduate courses reward students for finding the “right” answer. Success in class is measured by the ability to accurately retrieve and plug in the single correct answer as it appeared in textbooks and lectures. What I want to incentivize instead is a willingness to intuit many possible answers and then to use textual evidence to shore up those intuitions into coherent arguments. Articulated connections--even if they are a bit out there--are what I want to see in their work. There isn't a "right" answer. There are just those that are better or more cleverly worked up from the evidence at hand. Of course some people are better at this kind of thinking than others, but we can all get better with some intentional effort and practice. 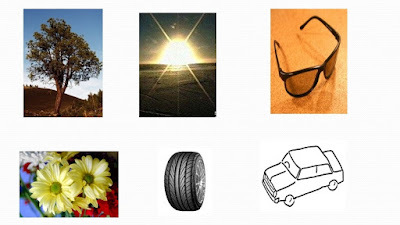 The exercise above with the six images becomes a touchstone for what I want students to do in class (what earns the higher grade). After all, the texts we read over the semester are just a data set of information, a bit more complex and richer than the six images, but a data set nonetheless. If students can see how to analyse Hector's interior monologue about facing Achilles using Elizabeth Kubler-Ross' stages of grief, that's fantastic. If they use Jung's concept of the "shadow" to talk about Gulliver and the Yahoos, I'm their biggest fan. So long as they can use the evidence to make their case, they are in the game. Does this mean they all make brilliant connections? Um, no. I suffer through a lot of superficial ideas, but that's okay. I would rather have students attempting to do this than not doing it at all. As the class goes on, the data set for their connections expands. In most of my classes, for example, there are between 7-10 primary source texts, and I am constantly trying to keep the texts we have completed in our conversation. So if we're reading Seneca's treatise On Anger, I'm constantly prodding them to think back over the texts we have completed to identify other times we have encountered the theme of anger (in the Iliad, Oedipus, Greek mythology). If we're talking about materialism in Petronius' Satyricon, for example, I'll ask them to concept map attitudes toward money in all previous texts. Articulated connections (with cited supporting evidence from multiple texts) receive the highest grades. The more coherently articulated synthesis in their writing, the better the grade. How do the values expressed in Matthew 5-7 connect (or not connect) with those held by Homeric warrior heroes? How does Dante's view of lying and betrayal connect (or not connect) with Machiavelli's ideas on the subject? How does Socrates' moral duty to his society connect (or not connect) with what MLK says in Letter from a Birmingham Jail? Note: I'm not asking the students to answer these questions, just come up with them. But the very act of generating these questions on their own begins to self-cue how these ideas might go (or not go) together. It also whets their curiosity. 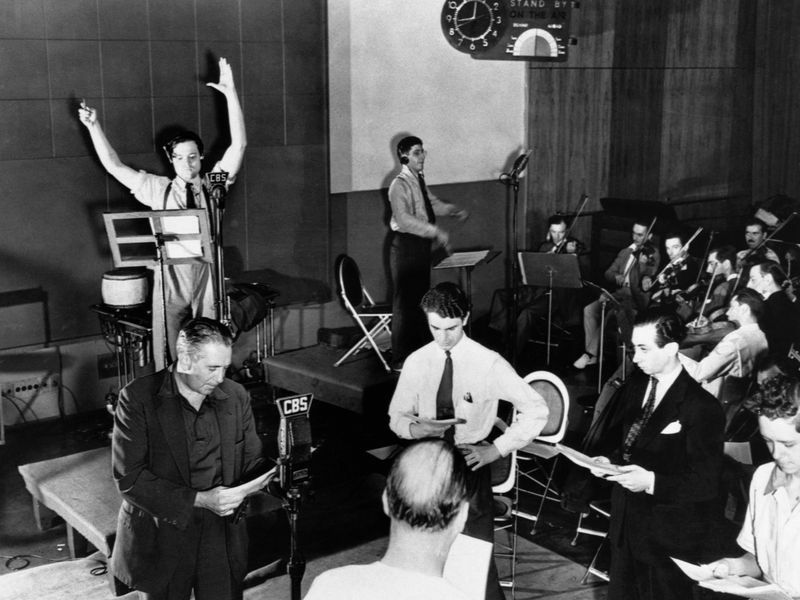 They'll say to me "Do I have to write about your question, or can can I tackle the one I asked?" Uh, yes. Of course. I want you writing about a question and connection that you discovered yourself. I realize that my discipline lends itself to this kind of cognitive prospecting. (If they develop an 'out there' reading of Homer, who really cares? I'm not teaching neurology or engineering here). What's surprising is how much students like making their own connections and then exploring them. Well, most students. There remain some who would be happy to spit back their lecture notes and move on, but fewer than you might imagine. Okay, bottom line: making students generate questions that seek connections (good ones and bad) causes them to self-cue relevant prior knowledge. No, they don't automatically become experts, but the very experience of doing it is empowering and it begins to move them from the paradigm that knowledge is received and toward one where they become more active participants in knowledge's construction. The questions we want versus the questions we get. 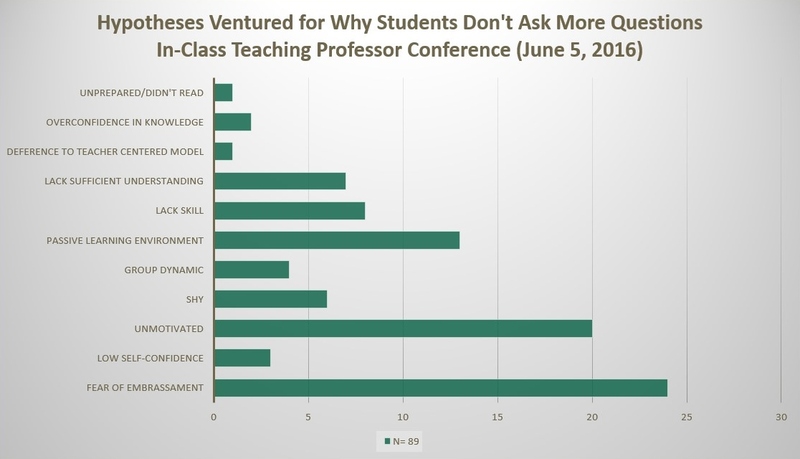 Why don't students ask more questions in class? 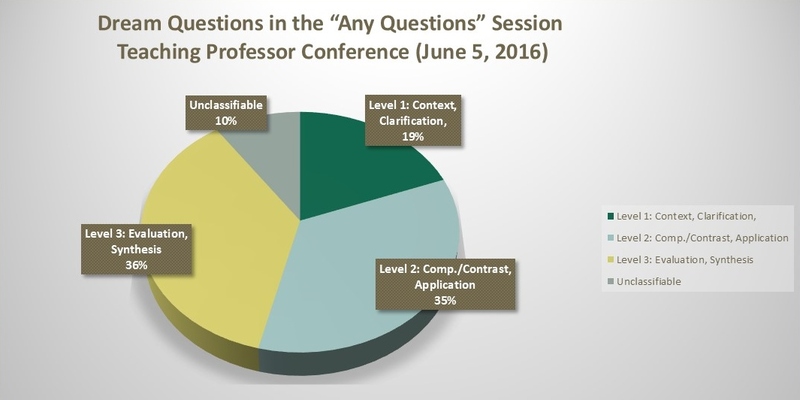 I asked for hypotheses on this from approximately 90 college and university professors at The Teaching Professor Conference in June 2016. The results, while not a scientific sampling, were interesting. 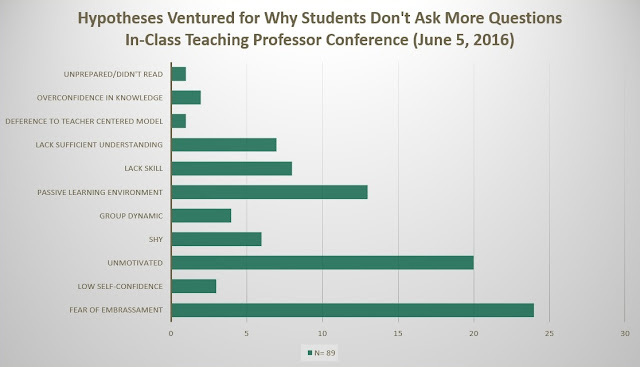 The number one theory for why students don't ask more questions was fear of embarrassment (or some variant like shyness or lack of confidence). I've posed this same question to my students and they offer similar ideas for why they and their classmates don't ask more questions. But what if all of these hypotheses are wrong? What if our students aren't holding back due to fear of saying something embarrassing? Maybe there is an even more prosaic answer. They simply don't know how or where to begin. 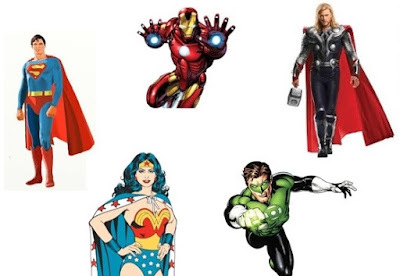 Consider the images of superheroes below and ask yourself into what logical categories they might be sorted. If you have background knowledge of superheroes and comics, you probably sorted these figures using information not contained in their visual representations. Maybe you knew that some were from DC and others from Marvel. Or perhaps you knew the backstories of these heroes (i.e., some are Justice League, some Avengers; some acquired their superpowers, others were born with them). But if you lack any of this background knowledge, you have to perform the task based solely upon the information contained in the images themselves (male versus female, masked versus unmasked, caped versus uncaped...). 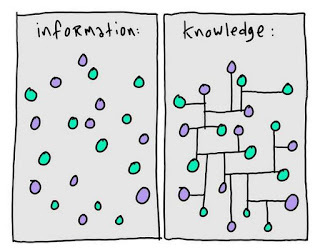 Experts simply bring more to this task than non-experts. Consequently they ask richer questions about possible relationships and contrasts. Seventy percent of these dream questions required higher-order critical thinking from the middle to the top of Bloom's taxonomy. In other words, the questions we dream of hearing are the kind asked more often by experts than novices. This isn't to say that students can't ask these questions. It's just that they are unlikely to self-generate them without some structured prompting and practice. So it probably isn't enough for us to periodically ask the class if there are "any questions?" It's a teaching move that 8 out of 10 times is met with silence. 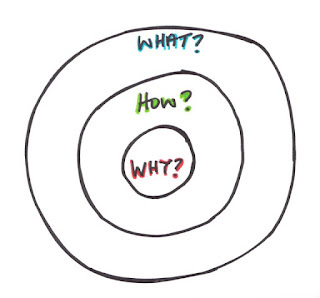 Students just need more help framing good questions. 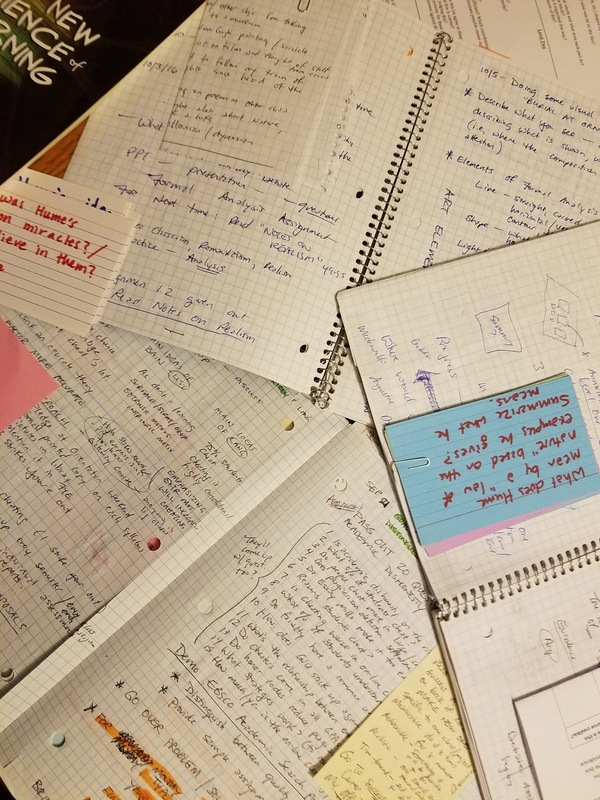 Some professors have helpfully adopted the "muddiest point" exercise, in which students review their notes and formulate a question about the material they least understand. This is useful. It at least gives students a place to start. What's needed are similar structured starting places for student-generated questions requiring thinking skills higher than simple understanding (i.e., application, evaluation, comparison, etc). Still to come: what these starting places might look like. You mean there's a name for that? One of the gimmicks I have been messing with over the years is student-generated questions. I often have the class quiz me during the first five minutes of the period over what we talked about last time or the assigned reading. Note: they don't have to answer any questions. They just have to formulate them. What is the Copernican system? Who wrote Satyricon and when? What was going on at the time? What does the first full paragraph on page 217 mean? Level Two questions deal with applications, contrasts and connections. How do the traits praised in Matthew 5-6 contrast with the virtues of a Homeric warrior? In what way does Stoicism echo the values and perspectives of Hellenism laid out by Matthew Arnold? What modern figure in society most approximates a Homeric warrior hero? How? Level Three questions involve evaluations and implications. Unlike the creation story in Genesis, Hesiod's Theogony presents creation as unplanned, haphazard and with no sense of divine providence. What are the implications for how we explain misfortune in a providential or non-providential universe? Aristotle defines a human being as a creature with rational self-control over its impulses. If he's right, are children human? With a little practice and some question stems to work from, students get better at asking these kinds of questions. Not every question will be a gem, but at least it gets students posing critical questions that demand higher-order critical thinking skills to answer. Indeed, the three levels, roughly correlate to the hierarchy of critical abilities in Bloom's taxonomy. Turns out my little experiment actually has some grounding in educational psychology. What I've been playing around with even has a name: elaborative interrogation. When students reverse engineer ideas into a question, they begin to see connections and inferences they otherwise overlook. 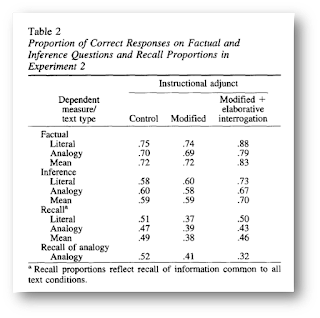 Most elaboration strategies (chunking, analogical recoding ) enhance recall, but elaborative interrogation also appears to enhance inference. Below is a set of findings from Learning With Analogy and Elaborative Interrogation by Mark McDaniel and Carol M. Donnelly. A control group was given material to recall, while the modified group used traditional chunking and recoding techniques to aid memory. 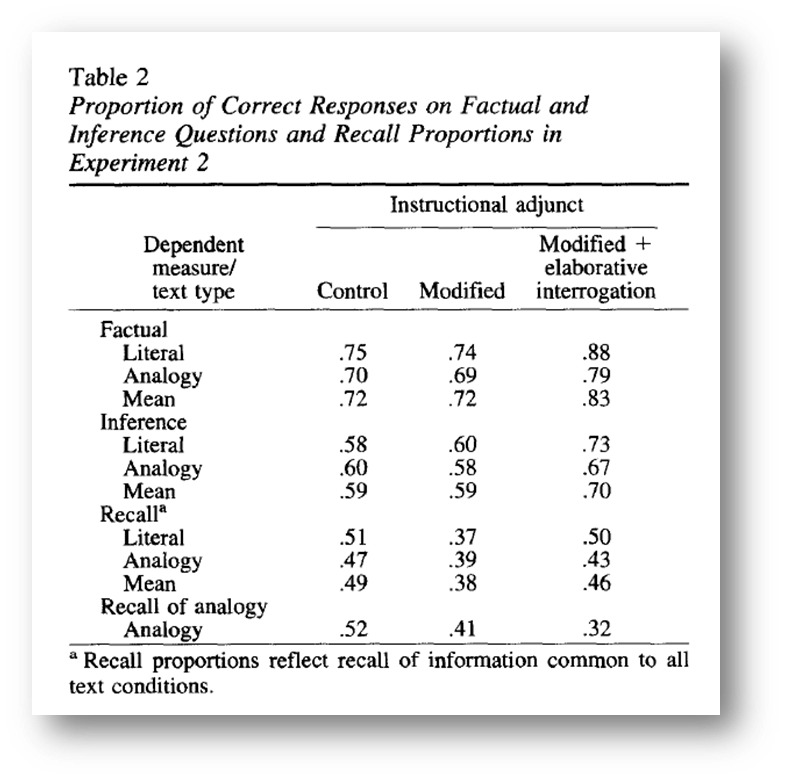 The third column shows the results for those using analogical recoding techniques and elaborative interrogation . These are the kinds of things I like hearing, so I've increased the prominence of student-generated questions in most of my classes. This fall, for example, I challenged students in my First-Year Seminar to design questions to ask in their other courses. This was an extra credit assignment and only a handful attempted it, but the early results are encouraging. In most cases the students' well designed questions (usually a level two or three question) blew up the class and launched really deep discussions. One young woman asked about an author's motivation for writing a painful memoir and reported back her amazement at how engaged her classmates became and--just as importantly--how energized the professor was by someone posing a good text-focused question in her class. My teaching tends to evolve along intuitive rather than research-based lines. I sense something works and start playing around with it. I have been playing around with student-generated questions as a teaching strategy for over a decade. I even developed my own question stems and a lot of in-class activities (some worked, some didn't). But here's the thing: I had no awareness that there was a body of research supporting this approach until this past summer. Indeed, I was stunned when I discovered the literature that explained why and how this worked. And that, in a nutshell, is the story of my teaching life. I fumble about in darkness and then unaccountably lurch onto something that seems to work. Then I fumble along some more in a general, unenlightened manner until one day--at a conference or while doing some idle reading--I discover that there's actually a freakin' name for the unnamed thing I have been doing in class. This approach both encourages and embarrasses me. On the one hand, my intuitions do seem to lead me in a good directions. Still, I can't help thinking that I spend hell of a lot of time in the dark. King, Alison. "Facilitating Elaborative Learning through Guided Student-Generated Questioning." Educational Psychologist, vol. 27, no. 1, Winter ‘92, p. 111-126. McDaniel, Mark A. & Carol. M. Donnelly. "Learning With Analogy and Elaborative Interrogation." Mc Daniel, Mark A.; Donnelly, Carol M. Journal of Educational Psychology, 1996, Vol.88(3), pp.508-519. The late Harvard Prof Timothy Leary once advised students to "tune in, turn on and drop out." I never made much of that remark except to view it as wanna-be transgressive marketing slogan, but it occurs to me that (setting aside the drop out part) it does capture two schools of thought about teaching. Some of us try to tune in by making our subjects relevant to students' lives or interests: the semiotics of emojis, Zombie Economics, Philosophy, Death and Mortal Kombat. Anytime I've taken this approach it's been a wince-inducing failure. A 56-year old white man whose interests include ancient literature, Northern Irish poetry, urban planning and fly fishing has little that's relevant to the 18-year old mind in the second decade of the 21rst Century. All I can do is try to turn on students to subjects and ideas that they usually aren't interested in or don't know exist. It's a heavy lift because we live in a tune-in era. Amazon, Netflix, I-Tunes and the ad-tracking software that follows us everywhere are forever trying to tune in to our tastes and choices with sophisticated algorithms: If you like this, then you should like... And these algorithms are fiendishly effective. Unfortunately higher education is an anti-algorithmic proposition in which the goal is to sew distrust of received opinions and un-examined inclinations. It's certainly not to target market to them. So it was a surprise last Thursday when one of my Humanities students lingered after class to talk with me. When students do this it's usually for one of two reasons Either they want to tell you that they won't be there next time or they want some clarification on an assignment. It's seldom because you said something in class that actually turned on their interest or excitement. Last Thursday I was introducing the ancient world views of the Hebrews and the Greeks. The former viewed the universe as providential, moral, planned and covenantal, the latter as unplanned, haphazard and governed by capricious gods who were anything but moral. 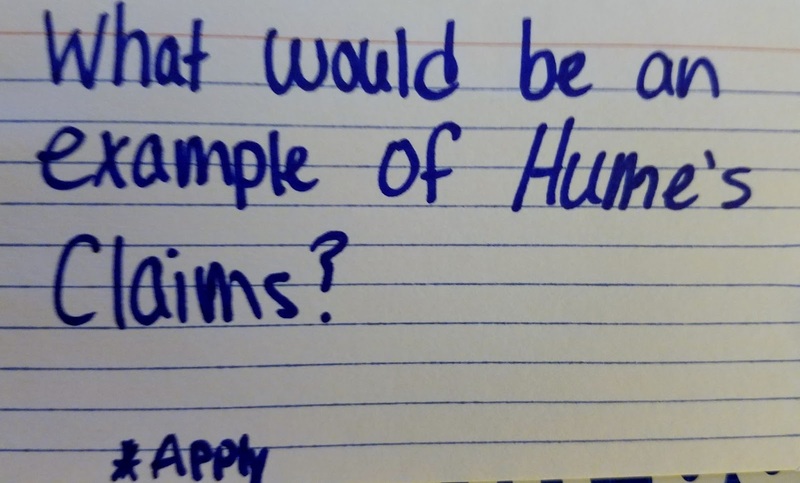 This student had made a connection between these ideas and a class in high school in which they discussed "the problem of evil." We spent a few minutes talking over the implications of a providential or non-providential universe and then he was off. When you get into teaching it's generally with a fantasy that you will be the hip professor, the one who gets the students, who is funny, ironic, interesting, inspiring. In short, you want be the one who knows how to tune in to them. It did not take me long to realize that I am not that guy. At best I can eke out a few minutes of fascinating a week, but every now and then--about once or twice a year--I manage to put something across that catches someone's interest. It's not the fantasy, but it's still nice when it happens. 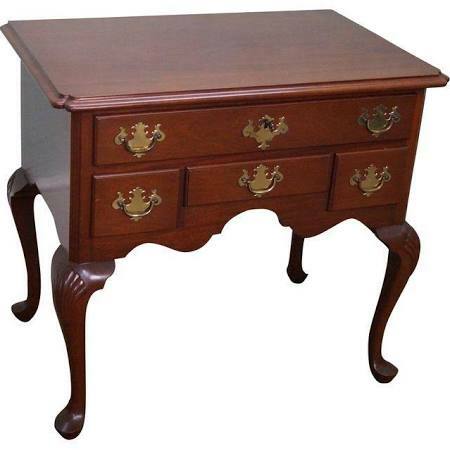 Maybe 30 years ago I read a John Cheever story called "The Lowboy." In it a typical middle-aged Cheever first-person narrator--well-spoken, flawed--is bequeathed an antique side-table long-coveted by his younger brother. The brother badgers, recriminates and emotionally blackmails the narrator until he agrees to let him have the thing, but there is an accident while transporting it and the younger brother becomes apoplectic. He even accuses the narrator of deliberately sabotaging the table, which is damaged but repairable. In the final paragraphs of the story, the narrator imagines his brother painstakingly recreating the original setting for the lowboy in his home. No doubt, he muses, his brother will have tried to replicate the cut-glass vase that used to sit on the lowboy. He'll have gone to great lengths to find an identical carpet on which to place it. And suddenly the narrator finds himself recalling the petty, bickering, unpleasant reality of the family that used to gather for reunions in the room where the lowboy sat. Later, when he visits his brother again, he realizes that his brother's attempt to preserve the past has only made him more peevish and miserable. So there you are. Nostalgia's a trap. 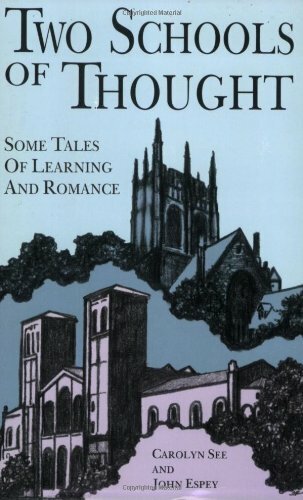 I keep thinking of Cheever's "The Lowboy" as a way not to get too sentimental about the 'how things used to be' at the college where I teach. Institutions change, faculty retire, administrators move on. If something doesn't change, it dies. Speaking of which, Bob Speed, a retired professor, passed away this past summer . He taught at my institution for over 45 years. He oversaw the choir and taught Humanities and English courses. I knew him fairly well and liked him, though--and he would be the first to admit this--he had his share of faults and frailties. On the day I heard of his death, I was in a meeting and mentioned his passing to colleagues. Maybe only one other person in the room had ever met him. Things change, friends pass away. Why should we be surprised? Why the urge to lament change or--worse--enshrine it with rosey lies? Bob neither wanted nor needed that. He left directions that there was to be no funeral. There was nothing special about our time. By the drama of our office politics and history. The old saw holds that you are doing well if you get a single new idea from attending an academic conference and I've usually found this to be true. More often than not, however, the new idea isn't some grand sweeping theory. It's likely to be a little gimmick, a way of passing out the syllabus or grading a paper. This past June, for example, I attended the Teaching Professor Conference in St. Louis. It's a three day teaching geek-fest for profs who want to share pedagogical methods and ideas. On the first day I did a little workshop on how to get students to pose better questions and then spent the rest of the weekend hitting interesting sounding sessions. One I attended concerned using improvisational theater techniques in the classroom. The guy who led it was a former improv comedian turned math professor who uses on-your-feet improv techniques to demonstrate math concepts. 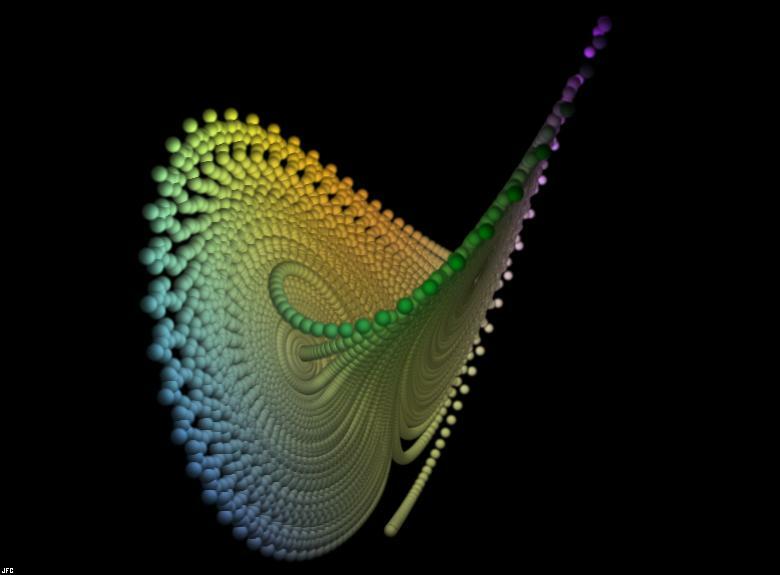 Mathematicians, he explained, are very interested in random dynamic systems. These are systems in motion that contain uncertain or unpredictable elements. Think of smacking into a hundred tightly packed billiard balls or, for that matter, predicting a stock price. To demonstrate this idea he asked the 30 people in the audience to stand up and look around the room. "Pick someone at random but keep your pick to yourself," he said. "This is your secret friend. Now look around and pick someone else. This is your secret enemy. In a moment I will say go and you must at all times maneuver so your friend is always between you and your enemy." Within seconds we had created a random dynamic system, a swirling dance of individual persons constantly adjusting to the changing positions of the other people. There was order because there clearly was a set of rules governing our motion, but there was also a bit of chaos because our choices had been randomly selected. Moreover, our motion paths would likely be different each time we played the game. Even so, mathematicians can actually model these systems using something called stochastic equations. I loved this way of demonstrating a complex idea and I learned something new, which is saying a lot because my math brain stalled years ago. I also keep thinking I need to find some way to steal this idea. That's the thing about teachers. They're the biggest thieves in the world, but that's okay because an academic conference is really a thieves market. It's heresy to say this, but teaching isn't really work. It's an activity and it involves effort, to be sure. But it isn't work. That's a term that should be reserved for things that have discernible beginnings and satisfying endings. Re-shingling a garage roof is work. Cleaning up the kitchen after a meal is work, but teaching? I don't think so. It just never gives you that satisfied sense of having definitively done something and done it well. I am by reputation and student evaluations a "good teacher," but I never feel that way. And I never get that sense of satisfaction you have when the last dish has been put away and the counter wiped clean. Indeed, I quite like to clean the kitchen, especially when I can let my partner stay at the table talking to friends over a postprandial cup of tea or glass of wine. The bigger and messier the stack of dishes, the better I feel when everything is clean and squared away. But why can't I ever feel that way about teaching? I suspect it's because the job lacks tangibility. What do you point to when you've taught something? Test scores? Rubrics? Graduation rates? Alumni whose names you often struggle to recall? Every semester ends the same. I stand alone in a room that has been emptying out one student at a time. They hand in their final set of reflections and leave. Sixteen weeks of work just goes pfffft amid empty desks and uncomfortable chairs. I often think this is what it will be like at the last final of my last class. 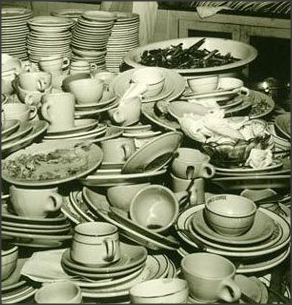 I will have spent almost 40 years doing something, but there will be no clean counter top or stacked pile of plates to point at with a sense of completion. See what I mean? Every semester there's always a few close calls. The final grades are turned in and suddenly there appears in your office or email inbox a few students begging for just one more shot at a higher grade. 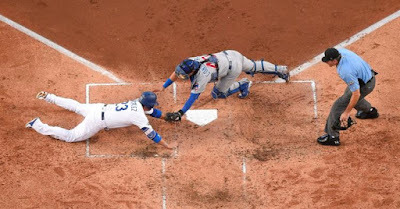 They are just a point or two shy of the promised land and they want to know if there is anything--anything at all--they can do to change the call. You explain to them that in fairness you can't really amend the rules for one without opening that opportunity to all, which is impractical. The semester simply has end at some point. Besides, you say, the deadline for revisions was announced in class and on the syllabus. (I even emailed each student with some strategic suggestions on what they might want to revise weeks ago). For most, this response is enough. They took their shot or made their case. They aren't happy, but they accept it. A few, however, want to re-litigate the grading standards or at least they want you to explain again why you gave this paper a C when an earlier one got a B. It's a fair question and I always oblige. Still it probably doesn't take the sting away from missing an A by two points. Perhaps the problem could be solved by cosmetically changing the grading scale. Instead of a 100 point scale, why not have a 1000 or 10,000 point scale? An 89/100 just hurts more than 8,900 out of 10,000. I read about a study in which people were asked to rate the happiness of Olympic athletes on the medal stand. Turns out the silver medalist is seldom as broadly smiling and the bronze medalist. Win the silver and you think I was that close... Win the bronze and you're just happy to be there. Outrageous as a sea, dark, wasteful, wild. Try as I might, I've never been any good at course planning. That's not to say I don't have a plan, because I do in an inexcusably intuitive sort of way. What I don't have is a clean, clear course map with each activity exquisitely linked to a well-articulated objective. And for years I've felt secretly guilty about this (but apparently not guilty enough to actually change my sloppy approach to teaching). This year, however, I decided to take myself in hand and actually do something about this scandal. Instead of pre-planning and course mapping, I decided to just map what I did each day. Every morning I sat down and laid out the logic of what I was going to do in class. I wrote the objective across the top of the page and sketched out the day's activities for getting there. 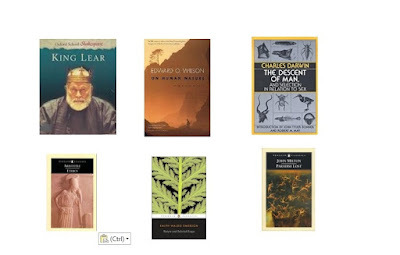 The goal was to externalize my courses and unearth the subterranean logic that made them a coherent whole. Once it was all on paper, I theorized, I would be able could look at them objectively and identify areas for improvement or revision. The semester ended last Friday, so now I have year's worth of teaching--five courses in toto--fully mapped on paper. All to the good, right? You would think so, but I sat down to look at them this morning and it occurs to me that they don't especially bring me any clarity. Instead they only seem to externalize the jumbled, dADa-ist messiness of my own mind. No one stepping in to teach these courses would be aided by this pile of inchoate cocktail napkin doodles. And I already can hear the sneering of the Grand Pedagogical Inquisitor: Where do these activities connect to your learning outcomes and how do you know the students are actually learning? Me: Um, well, they kind of connect here and sort of here and maybe here as well. And how do I know learning is taking place...? That's a good question. GPI: And do you have an answer? Me: Yes, well, I ask the students and they tell me. GPI: What do you mean you ask the students? Me: I have them write a paper in which they tell me about the ideas that made an impression on them and evaluate the degree to which their thinking and writing have gotten stronger. Me: I don't call it that, but yes. I ask and they tell me. GPI: (Shaking his head wearily) No, no, no. That's simply unacceptable. Me: Don't you think I know that, man? Don't you think I know? Okay, so where am I? Has this little experiment imposed any order onto the chaos? I think yes and no. Yes, it's helped me to realize that I am in my own lost in a dark wood sort of way working toward the course objectives in creative ways that are often reflective of what cognitive science tells us about how the brain learns best. But I would have to say no when it comes to providing objective evidence that learning is actually taking place. I would really love to make a self-justifying analogy here between cooking and teaching. It's possible to make a delicious pot of pea soup without knowing anything about the complex chemical reactions happening between the heat, the peas and the copper pot. That said, knowing some damned chemistry wouldn't kill me, would it? Oh Grand Pedagogical Inquisitor, just give me an ambiguous kiss and go away! You probably shouldn't be surprised that your teen-aged son has suddenly become sullen, uncommunicative and deeply embarrassed by the mere fact of your existence. I mean you likely gave your father the same treatment at that age, right? Nevertheless you are surprised. How could this charming, interesting kid--with whom you formerly had deep, thoughtful conversations--be the same person who now views every interaction with you as some form of hostile interrogation? You only hope that once the sturm und drang of adolescence passes, the two of you will reconnect, that it will be like it was again. You hope, but you also wonder. Or at least I do because I never did reconnect with my old man. Occasionally, though, there's a kind of re-connection. The other morning, for example, I was driving to work with the Ipod jacked into the car and on shuffle. Then up pops an old Nancy Wilson song. Did you say I have a lot to learn? Well, don't think I'm trying not to learn. And suddenly there's my old man in our living room. He's got his palm pressed tight against the side of his stomach and the other arm extended out to an imaginary dance partner. And he's swaying to the music, eyes closed, smiling. The 8-track player is blasting out The Best of Nancy Wilson and my jaded 14-year old self is reading across the room, half-listening and deeply embarrassed by this man's pretension that he's some kind of smooth dancer. Even so, I'm listening to the music and thinking, "You know, this really isn't too bad." Under no circumstances am I about to tell him that, however. Then years later, probably late at night, maybe after a scotch or two, I find myself browsing through I-Tunes and I'm surprised to see Nancy Wilson's politically-incorrect "Teach Me Tonight." available for 89 cents, and I think "What the hell?" Of course I promptly forget downloading it until, through whatever unfathomable algorithm, it appears one morning and along with it my dancing, swaying father who spins and dips as the song comes to close. Teach me, come on and teach me, teach me tonight. The old man looks over at me. "That's Nancy Wilson," he says. 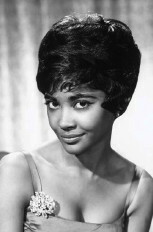 "Miss Nancy Wilson to you." And I grimace and nod back at him. You see? We did connect on the rare occasion. Still do. So maybe there's hope for me and my kid. Last night, for instance, I noticed him across the room buried in his laptop. He hadn't spoken for over an hour, but when a Dead Kennedy's song popped up on my playlist, he started quietly singing along. Knew all the damn lyrics, too. Last week in First-Year Seminar my students and I went over some research on procrastination, something nearly every one of them laments in their approach to academics. One idea that caught their attention was the "temporal discounting" effect." This is the human tendency to discount a reward's value in proportion to how far in the future it is. 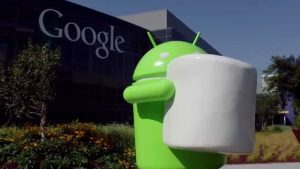 This, of course, is what was going on in Walter Mischel's famous 1972 study of kids in the marshmallow test, where children were offered a choice between eating a marshmallow treat immediately or waiting a set amount of time for an even greater treat. Some kids waited, but others couldn't. They wanted the immediate reward and discounted the value of the larger reward 10 or 15 minutes away. Bottom line: impulse control matters. Unfortunately modern life is filled with opportunities to temporally discount. Some companies like H & R Block know this. They offer clients an immediate refund on their taxes minus, say, a five or ten percent fee. This presents the customers with a choice not unlike the marshmallow test. They can wait six to eight weeks for the IRS to send them the full refund or they can take the lesser amount right away. Because many of us discount the value of future rewards, we take the ready cash. And the genius from H & R Block’s point of view is that their clients walk away happy despite having volunteered to pay substantially more to get their taxes done. And it's not just H & R Block. Tech companies also know how to tap into our weaknesses. Clicks and on-line traffic equal revenue so they have every incentive to make apps, games and software into tempting time wasters. Cognitive scientists have shown that every incoming message is accompanied by a little dopamine hit that, like mathematically-timed jackpot payouts, will keep us coming back for more. There's a reason it's so hard not to check the phone when it buzzes or beeps. That buzz is a marshmallow. Why wait? Something similar happens with students in college. The immediate reward of doing something fun like playing X-Box or checking social media far outweighs the temporally distant reward of a good grade. And let's face it: grades (or the fear of bad ones) are fairly weak motivators for many students, especially when they are weeks or months in the future. What's interesting about Mischel's study is that the kids who delayed gratification used intentional strategies to distract themselves from the immediate reward. They turned away from the marshmallow, closed their eyes, sang a song... When researchers proposed such strategies beforehand to the "low delayers," they we are far more likely to wait the prescribed time. The take away is that procrastination is largely innate. We all do it because it probably made sense at one time for us to go for the meal at hand when we weren't sure when the next one was coming. That said, procrastination isn't destiny. It's possible to override our instincts; we just have to be intentional about it. We can try creating short-term rewards for getting work done (if I get a rough draft done tonight, I'll treat myself to X). This works for some but not many. One of my students said she tried this and failed miserably because she kept sweetening the deal: if I work on this for even 10 minutes I get the treat. We might also take a lesson from the kids in the marshmallow test and deny attention to the tempting reward. This is the method used by App Detox or other software that "locks you out" of time-wasting social media, games or apps, a kind of fight fire with fire approach. You simply cannot access these programs for a specified time. But do we need more tech to de-tech? I mean you could get similar results by leaving the phone and laptop in your room and writing in long-hand in a library study carrel. A more drastic approach for chronic procrastinators is to employ the Xenophon strategy. Xenophon was an ancient Greek general who lead 10,000 mercenaries back from a failed mission to Persia. Harassed, outnumbered and finally cornered in Asia Minor, he drew up his troops to fight by positioning them with a sheer 300-foot cliff immediately at their rear. When one of his lieutenants questioned the move, Xenophon pointed out that their position made it clear to both the men and the Persians that there would be no running away. In effect, he gave himself and his men no choice or such a grim one that it provided the required motivation. You could accomplish something similar by handing over the X-box to someone and making him promise to sell it and keep the cash if you don't get the work done. It's a desperate strategy, but it would really focus your attention. I read once about a woman in the Civil Rights movement who had tried repeatedly to quit smoking. Nothing worked. Finally she wrote a check for $5,000 to the KKK and gave it to a friend with the instructions to mail it to the Klan if she ever smoked again.